What’s the difference between walruses and seals? Both animals are expert swimmers and hunters. Both live in cold waters and both have thick layers of blubber to keep them warm. Walruses are bigger than most seals and they have tusks. The tusks are actually long, sharp teeth that can grow 3 feet long. Both males and females have them. The tusks are actually long, sharp teeth that can grow 3 feet long. Both males and females have them. Walruses use their tusks to pull their big bodies out of the water onto ice. Sometimes they use them to catch prey or to poke air holes in the ice. Walruses gather on beaches by the hundreds. They grunt and bellow at each other. 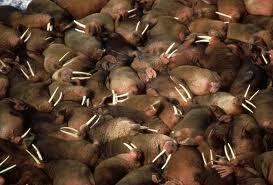 Walruses gather on beaches by the hundreds. They grunt and bellow at each other. During mating season, male walruses aren’t so friendly. They fight with each other for mates. 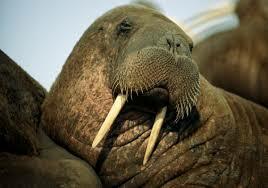 Walruses use their whiskers to find shellfish on the ocean floor. Walruses live in cold Arctic areas. Walruses spend most of their life in the water. They rest and have babies on ice chunks floating in the ocean. Sometimes they rest on land when no ice is available. 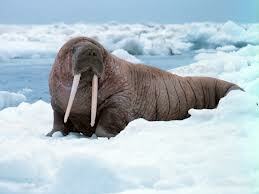 All About Walruses: Walruses live in cold Arctic areas. They rest and have babies on ice chunks floating in the ocean. A cute video about a walrus exercising with a trainer. Question: Are walruses good mothers? 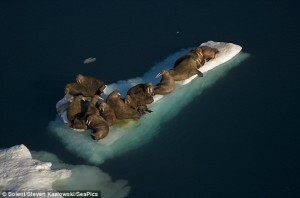 Answer: Yes, walrus mothers take good care of their babies and sometimes even help each other with parenting jobs. Question: When do babies grow whiskers? Answer: Babies are born with a whiskery mustache. Enjoyed the Easy Science for Kids Website all about Walruses info? Take the FREE & fun Walruses quiz and download FREE Walruses worksheet for kids. For lengthy info click here. Declan, Tobin. " Fun Walrus Facts for Kids ." Easy Science for Kids, Apr 2019. Web. 24 Apr 2019. < https://easyscienceforkids.com/all-about-walruses/ >.